Rafting the Middle Fork of Idaho's Salmon River is a true bucket list adventure, even for seasoned rafters! The intermediate Class III-IV rapids welcome beginners as our professional guides give you all the tips you'll need to navigate by paddle through unforgettable riverside landscapes. They'll surprise you and you might just surprise them as you explore old mining camps at Powerhouse Rapids. You'll be amazed at the feasts we enjoy for lunch and dinner! Listen to the soothing sounds of the river flow past you and breathe in pristine, fresh pine scents from the surrounding forest. Don't forget to bring a waterproof case for your camera. This rafting trip in Idaho is beyond scenic. Cheer each other on after making it through Haystack Rapid. You deserve it! Marvel at pictographs of the Native American Tukudeka, or Mountain Sheepeaters. 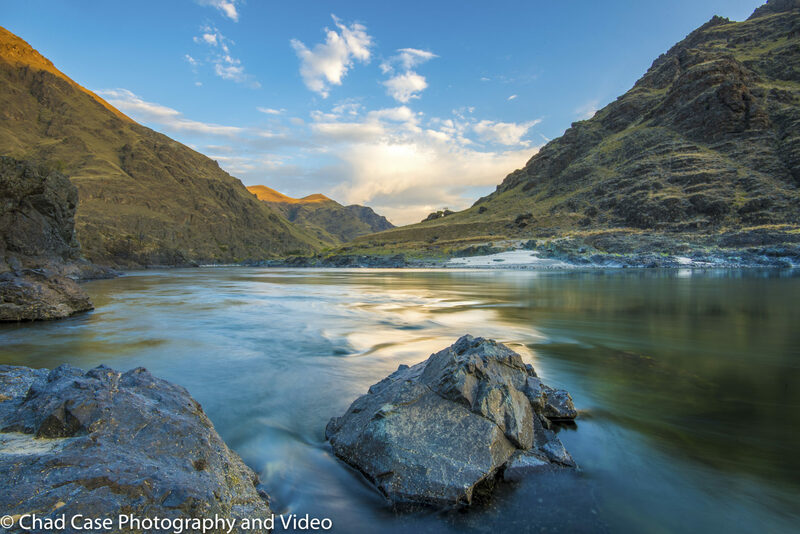 Learn about the history and geology of the River of No Return Wilderness. Stop at Waterfall Creek, where a steep trail leads up to the Bighorn Crags. Hike to the base of Veil Falls, a magical cavern where you can see more ancient pictographs. As you wind up your rafting adventure, enjoy lunch on a sand beach just a few miles from the Middle Fork’s confluence with the Main Salmon. This thrilling, seven-day rafting journey in Idaho down the iconic Middle Fork of the Salmon River in late August 2019 is a scenic outdoor camping adventure like no other! At the beginning of your Middle Fork of the Salmon, Idaho rafting adventure, you’ll have a chance to get to know your future rafting buddies as you take a scenic flight to Indian Creek on the Salmon’s Middle Fork. Enjoy a bird’s eye view of the canyon before experiencing it on the river. The best part is just ahead: the first fifteen miles of the river are filled with fast, steep Class III & IV (intermediate/advanced) rapids. But not to worry if you’ve never rafted before! Beginner rafters are welcome and you can easily learn everything you need to know via a safety talk and paddling tips from your professional rafting guides. After your instructional session, you and your rafting mates will “put in” and launch your rafts – riverside. You’ll need to work together paddling in sync with the skillful commands of your guides to navigate the narrow channels of the Middle Fork of the Salmon. Once you make it to camp, you’ll have time to hike or fish before a delicious dinner cooked over the campfire. In the evening, you and your new companions can share your favorite moments from the day as you enjoy the warmth of the flickering flames. The next day, enjoy a soak in the cascading cliffside pools of the Sunflower Flat Hot Springs. Later, marvel at the pictographs that the Tukudeka Native Americans left behind on the canyon walls. You’ll have plenty of fun on today’s rapids. Stargaze in camp with your new friends before letting the river lull you to sleep. The rapids continue as you pick your way through the Rockies. Keep an eye out for big horn sheep clambering along the impossibly steep slopes, and golden eagles circling overhead. The Haystack Rapid – the river’s most dynamic – marks the head of Impassable Canyon. Walk beneath the falls at Waterfall Creek to cool off from the hot day, and later hike to the base of Veil Falls, where caves filled with stunning pictographs await. Your last day on the water takes you past the hideout of Earl Parrott, an infamous hermit who made his home in the canyon. Enjoy a final meal with the adventurous and intrepid women who shared this rafting journey with you on Idaho’s Salmon before heading home. Filled with outdoor excitement and physical challenge, this August 2019 Salmon River rafting trip in Idaho is a refreshing and invigorating outdoor adventure like no other! Never been rafting before? No sweat! Look at how much fun you can have as you watch our Canadian Rockies group brave the whitewater! Conquer the Haystack Rapid, the river’s most dynamic, at the head of Impassable Canyon – Go AdventureWomen! When you land at the Boise airport, take the free shuttle to the Holiday Inn Express & Suites. Enjoy an evening on your own, or meet up with your group in the hotel for a drink and dinner! After enjoying breakfast with your group, hop on the bus and take in the scenery on the drive to Stanley, Idaho. Enjoy lunch along the way. Welcome to pristine Stanley! Settle in, take a walk around town, or schedule some time at a private hot spring (at your own expense). Enjoy a welcome dinner at the Mountain Village Resort with your AdventureWomen friends and one of your guides. After dinner, have a safety orientation and talk about gear for your rafting trip. Get a good night’s sleep – you’ll be on the river tomorrow! After an early breakfast with your group, you’ll take a short, scenic flight over the canyon to Indian Creek, the starting point of your rafting adventure! Enjoy the bird’s eye view prior to experiencing the canyon on the river. Choose a spot in a raft and head down the river. The first section of the Middle Fork is fast, and the rapids are steep, narrow, and come in quick succession. Enjoy lunch as a group and learn about AdventureWomen’s Leave No Trace camping ethics. The river will continue to be lively and challenging this afternoon. Every few hundred yards, a creek enters the river increasing its flow. Arrive at camp around 4:00pm. After you settle in at camp, take some time to hike, fish, read, or just relax. Enjoy hors d’oeuvres around 6:00pm and dinner around 7:30pm. After dinner, hang out around the camp fire and swap stories with your fellow AdventureWomen. Enjoy freshly brewed coffee and breakfast. Pack up your personal gear (your tents are taken care of!) and hop back in your rafts for another day on the river. As you raft down the river, stop for a soak in Sunflower Flat Hot Springs, where several pools above the river cascade over a rocky cliff to create a natural shower. Later, stop to view pictographs of the Native American Tukudeka, or Mountain Sheepeaters, who lived in the canyon until the 1870s. Have plenty of fun on today’s rapids as the river continues its quick descent. Take some time to hike, fish, or relax before dinner this evening. Make sure you look at the stars – the night sky is spectacular! Experience another fun day of rapids and incredible Rocky Mountain scenery. Keep an eye out for Bighorn Sheep as you pass several mineral licks. Pass your last hot spring at Hospital Bar, named for early cattlemen who let their stock rest and feed at this large flat. Run the Tappan Rapids this afternoon, a great opportunity for photos with plenty of splashing and thrills. Enjoy a riverside lunch. Watch for golden eagles and falcons. The final miles into camp this afternoon give you a chance to lean back and soak in the monumental scenery of the River of No Return Wilderness. Enjoy another fun day along the river. This morning, you will run the Haystack Rapid, the most dynamic on the river! Side canyon “blow outs” have changed its course twice in the last few years. Below Haystack Rapids, the canyon narrows and deepens, creating a series of action-packed rapids. A riverside lunch allows you to swim and enjoy the cool water of the Salmon before making your way to camp. A favorite stop today is Waterfall Creek, where a steep trail leads up to the Bighorn Crags. Walk beneath the falls and take a jump into the river! As you head downstream, the river cuts into the Idaho batholith – the largest monolithic chunk of granite in North America. Further downstream, you’ll hike to the base of Veil falls, a magical cavern where you can see pictographs. The scenery today is astounding. Enjoy your last night on the riverbank tonight. Soak in the crisp air and make sure to take some time to look at the stars. The river will take you past the former hideout of Earl Parrot, the Hermit of Impassable Canyon. Savor the excitement of the last few big rapids as you pass through stunning vistas. Enjoy lunch on a sand beach just a few miles from the Middle Fork’s confluence with the Main Salmon. Take out of the river, grab your gear, and hop on the bus for a two-hour ride to Salmon. Enjoy a farewell dinner as a group to toast an amazing trip with your new AdventureWomen friends! Have an early breakfast and hop in the bus for the five-hour drive to Boise. You’ll be dropped off at the airport where you will say goodbye to your new AdventureWomen friends. Arrive: Arrive in Boise, Idaho (BOI) on August 29, 2019. Depart: Depart Boise, Idaho (BOI) on September 6, 2019 after 4:00pm. Tips are appropriate and accepted only if your expectations are exceeded. A suggested range is from 5-10% of your trip cost. Tips can be given to the Head Guide, who will distribute it equally among all of your crew. Final payment is due to AdventureWomen in a cash form (check, money order, or wire transfer) on or before May 31, 2019. Mountain Village Resort is a beautiful Idaho resort in Stanley, which acts as a gateway to thousands of adventures and activities such as rafting, hiking, biking, and climbing. Don’t miss a chance to try out the private natural hot springs, reserved for guests only. Reserve your time with the front desk upon arrival! The cargo raft, along with two crew members, will arrive at camp ahead of you to set up the kitchen (including dining tables and chairs!) as well as your sleeping tents. When you arrive in camp, all you have to do is carry your personal gear to your tent and roll out your sleeping bag, sleeping bag liner, and self-inflating foam sleeping pad (all provided for you). At camp, you will have a toilet tent with a handwashing system nearby, which will be available from the time you get to camp until you leave the next morning. During the day, a toilet will be available for solid waste. Bring ziplock bags for disposal of feminine hygiene products. Solar showers will be available for use with biodegradable products, but most women feel clean after frequent swimming! The Stagecoach Inn is nestled in the Bitterroot Mountains along the Salmon River. Enjoy the many comfortable sitting areas where you can relax and enjoy the peaceful sounds of the river. Weather in the area is unpredictable. You must come prepared for cold/wet weather and hot/sunny weather – sometimes even in the same day! The following information will help you be prepared for the expected as well as the unexpected events of your trip. You may not end up using all of the gear listed below, but we recommend bringing it all. Clothing layers are your thermostat in the outdoors. All of your on-river clothing should be made from synthetic fabrics like fleece, pile, polypropylene, Capilene™, or polyester. Quick-dry clothing works well on the river. A light cotton button down shirt or t-shirt can be used on hot, sunny days, but cotton clothing is best saved for on-shore camp use. Your luggage must weigh less than 25lbs and be in a 12” x 13” x 24” soft-sided duffel bag (no hard frames or wheels are permitted). This duffel will be placed inside of a waterproof bag. 1 pair water shoes or sandals/sneakers that can get wet. Ankle straps are required. Fishing gear and Idaho fishing license if you plan to fish. What guests are saying "Idaho: Rafting the Middle Fork of the Salmon River"